Bodet has made quite a name for itself in the Time & Attendance field. They have over 4 million users and an enviable 96% customer satisfaction rating, so they must be doing something right. Let’s take a look at their core offerings. Kelio One or Kelio Pro? Bodet offer a variety of options for clocking hardware, as well as apps. They are all built to work seamlessly with the Kelio time and attendance software, and you can integrate more than one option if you wish. All of Bodet’s clocking terminals feature interactive touch screen controls and allow employees to do quite a bit more than merely clocking in and out. Bodet’s biometric fingerprint clocking-in terminals can scan and record either fingerprints or whole hand prints to ensure employee login security. In addition to added security these machines offer convenience- after all, you can loan out or lose a key fob or badge, but it take a very careless employee indeed to lose track of their fingers! On the downside, these readers rely on a clean environment- if this could be a concern, the Visio terminals may be more suited to your business. The Visio X4 and X7 terminals have customisable touch screen interfaces and support NFC (wireless) clocking using a key fob or card. They also feature a built-in camera, making ‘buddy punching’ a thing of the past with reliable biometric security that works even in outdoor or less sterile working environments. The Visio X7 is just as impressive, but also boasts personalised user interfaces. It also has an even larger 7-inch screen, letting you pack in substantially more of your corporately themed graphics and custom options. The Visio X7 is Bodet’s flagship terminal, being so intuitive and well designed in fact, it was honoured with a Red Dot Design Award following its release in 2015. Learn more about getting a Bodet time and attendance solution with the Visio X7 in the video below. 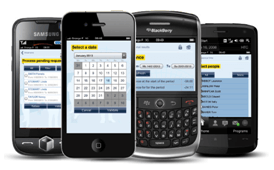 Bodet’s Kelio software can be used from a smartphone app, with Kelio Mobile available for Blackberry, iPhone and Android phones. There is an app for employees as well as managers. Changes made using the Kelio Mobile app are synced instantly with all other clocking terminals in your system. Managers can also see the real-world locations from which these interactions were made. This is essentially the mobile app, but specialised for desktop machines. Employees can clock in and out from their desks, and well as engaging in all of the interactions possible at other terminal types. In order to reduce demands on your HR team, employees can also view and even modify much of their personal information on the system quickly and efficiently. 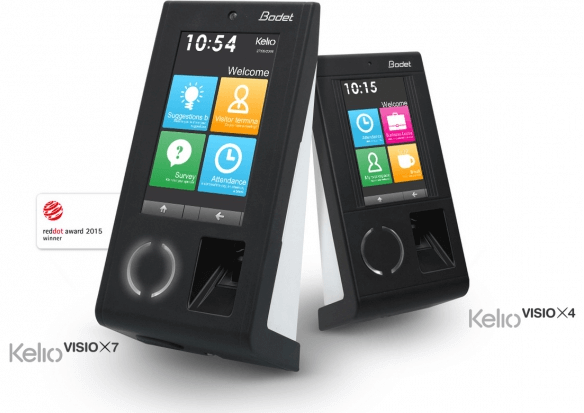 Bodet’s Kelio Touch Terminal is built specifically for the Employee Self-Service software module (read more about Bodet’s software below). It features a 17-inch touch screen above a weighted pedestal and has an optional card reader function for swift employee identification. The system connects via Ethernet (TCP/IP) and allows employees to submit leave requests as well as log time spent on certain projects. Employee Self-Service This module allows your employees to see too many of their HR needs themselves, taking much of the pressure off your HR department. Absence requests, clocking in and out (in the office or from home) can be handled without HR oversight, and you can assign access to personal results to individual managers easily. Staff Planning The planning module makes it easy to set up staff planning templates in accordance to regulatory compliance and personal or company policies. 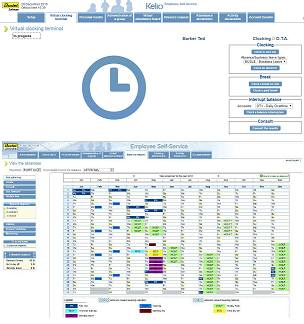 Better still, you can compare the planned schedule to the completed and estimated schedules in real time, so you know instantly whether things are going to plan. Analytics and Job Costing The analytics module helps you make choices more quickly and more efficiently, and ensure that you’re making the most productive employee assignments. Access Control and Visitor Management This lets you limit access to any or all of your facility either by zone, by assigned group. Better still, you can further limit that access to assigned work schedules. Data Exchange This module lets you export Kelio system data for reporting or use by other applications. 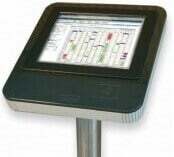 For example, Kelio Paylink supports transfer to over 140 payroll applications. You can facilitate data transfers when you need to, or automate it. Both data mart and web services are supported. Multi-site and HR Assistant The multi-site management and HR assistant module makes sure managers can access employee files no matter where they are based, including training and appraisal records, emergency contacts and personnel files. Mobile Clocking This module makes it easy for employees to clock in and out or to assign their time to different projects using their own or company mobile devices. 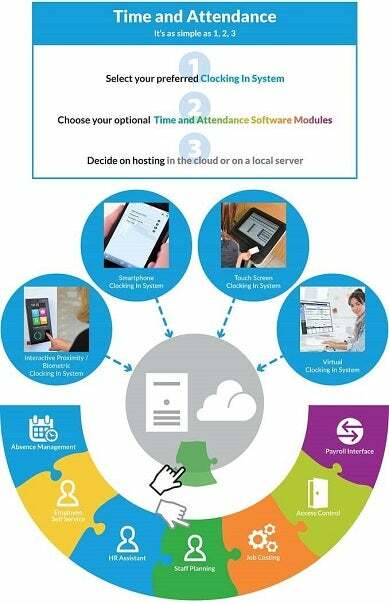 One of the real strengths of Bodet’s Kelio Time and Attendance Software system is entirely modular, making it the perfect fit for organisations of many different types and sizes. For smaller and mid-sized organisations this essentially means if you don’t need a feature, you won’t have to buy it. For larger organisations, Bodet can give your organisation a comprehensive software package, assembling all the modules you need to achieve your business goals. Perhaps need fully integrated HR, security and payroll systems. Perhaps you just need a way for a handful of employees to clock in for their shifts. Either way, you can’t go far wrong with Kelio. After setting up your bespoke modular system, it is just as easy to downgrade as it is to upgrade it. Eliminate modules you initially chose to integrate that you don’t actually use, or simply don’t use enough to make a business case for keeping them. The modules that you keep will continue working just as always, without any drama. This is something that sets Bodet’s offering apart from many others! The system can be hosted locally, or it can be cloud-based, so that no matter what scale you need from it, it needn’t take up your IT resources. Analysing data can be tedious task, but Bodet’s intuitive standard reports make it easy to monitor your employees. You can also set up your own custom reports if needed. These reports can be exported to Excel, and other applications with the data exchange module. To stay in the loop 24 hours a day you can even set up real-time alerts for abnormal activity or listed events. You can expand, reduce, or swap out modules at any time, without penalty No strings attached. Change your mind. Test a module for a month without committing to it long term. Review accurate reports with real-time tracking, any time of day or night Never make a decision based on anything but the most recent information. Stay on top of business activity no matter what time of day you choose to work. Software support and updates are included in the base price No hidden costs further down the line. No worries if something goes wrong. Works well in office, warehouse, and remote working situations No complications, no stress. Moving office? Multiple work sites? Working from home? Smooth operations throughout. When choosing your Kelio software modules you will be asked if you’d like the Kelio One or Kelio Pro versions. Kelio One is the ‘basic’ level of the Kelio software system modules. As you might expect, Kelio Pro gives you the same modules but with all the ‘bells and whistles’. In addition to the larger scale Kelio system, Bodet markets the Timebox ‘all in one’ solution, specifically for SMEs. This is a far more simplified set-up, but includes everything you’ll need to efficiently and accurately track and clock-in up to 100 employees. The terminals, security badges, software and support are all included in the basic price. It even sports a few advanced features like anomaly detection and tracking and automatic overtime calculation. Finally, when it comes to tools your businesses relies on, access to skilled, helpful customer service is an absolute must. Luckily, Bodet has spared no expense here, and its users rave about the how very responsive the company is. So, are Bodet’s systems everything they’re cracked up to be? It certainly seems so from here. Due to the bespoke nature of Bodet’s time and attendance solutions, price ranges vary. To receive an accurate price quote for your business simply fill out this form and one of our Experts will get back to you with tailored information. This service is completely free and puts you under no obligation to buy.